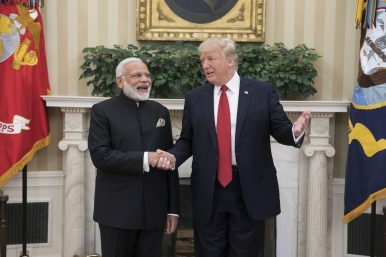 Over the past three decades, a standard opening line for U.S. policymakers dealing with India has been to observe that the U.S.-India relationship is between “the world’s oldest democracy and the world’s largest democracy.” Presidents Clinton, Bush, Obama, and Trump have all used variations of this refrain. Although Indian Prime Ministers have been less active in the use of the phrase, the president of India has employed it, and a plethora of high-level speakers from both sides have observed, with great solemnity, that the “common values” of democracy are a cement binding the two countries together. But is this still the case, and, if not, should it be? The preservation and spread of democracy seem markedly less important now to the governments of both countries. The Trump administration’s National Security Strategy gives only passing attention to the subject. Trump’s fawning relations with the anti-democratic leaders of Russia, Saudi Arabia, and even North Korea are by now notorious. Compared to the ringing “City on a Hill” pronouncements of Reagan or the ambitions for spreading democracy of George W. Bush, much less those by Democratic presidents, the conclusion that democracy overall is now a much less important consideration in U.S. foreign policy is inescapable. India has traditionally been cautious about expressing the defense and spreading of democracy as a primary value of its foreign policy. Nevertheless, beginning with the fall of the Soviet Union and Indian economic liberalization in the early 1990s, Indian leader after leader has lauded democracy as a distinguishing factor in India’s foreign relations. Now that Russia seems to have regained strength and the United States seems to be moving away from democracy as a guiding principle in its foreign policy, this praise for democracy has become more muted. More importantly, the actions of India in regard to Russia and China seem to show that democracy really isn’t all that important in the conduct of its external affairs. India is hedging its bets. Russia has resumed its position as India’s “all weather friend.” Modi has been quick to confirm Russia as India’s largest arms supplier, as its chief supplier of civil nuclear technology and materiel, and its overall best friend in international relations. Russia’s annexation by force of Crimea and takeover of eastern provinces of Ukraine seem not to have phased India at all. Russian attempted assassinations in the United Kingdom and its efforts to subvert democracy in the United States have passed without so much as a ripple of disapproval. Most recently at the G-20 in Buenos Aires, Modi went from a trilateral meeting with the U.S. and Japan that was hailed as a coalition of democracies in the Indo-Pacific straight into a trilateral with Russia and China, its colleagues in the autocrat-dominated Shanghai Cooperation Organization. The words and body language of the prime minister were just as warm for the autocrats as they were for the democrats. Both India and the United States would do well to return to a strong preference for democracy and democratic nations in the conduct of their foreign policies. The reasons for this strong preference are more than altruistic. Each country has a self interest in the long-run stability that comes from partnering with democracies. For centuries, democracy in the United States and elsewhere has facilitated the peaceful transfer of power from one administration to the next. In systems that do not have democratic legal restraints and dissent mechanisms, the times when transfer of power becomes necessary are periods of maximum danger for the nation and all those who look to that nation as a strategic partner. This time will come for China and Russia, and India too if it relies upon them. Autocrats may be successful in exempting themselves from the laws of political succession. They cannot exempt themselves from the laws of nature. Sooner or later autocrats must pass from the scene. A struggle for power ensues. Historically, Russia has never been a stable ally. In World War I, its government disintegrated in the face of Communist pressure and Russia withdrew as an opponent of the Triple Alliance of Germany, Austria-Hungary, and the Ottoman Empire. After World War II, Russia turned on its allies, imposed the Iron Curtain and plunged the world into the Cold War. During the Cold War, India looked to the Soviet Union for security and development support but instability rendered the Soviet Union incapable of providing the kind of partnership needed by a democratic India. The same goes for China. At the outset, China and India are strategic competitors, not partners. China claims Arunachal Pradesh state and other pieces of Indian territory. China is moving to establish dominance in the Indian Ocean through One Belt/One Road and a “string of pearls” maritime enclaves. China seeks subcontinent encirclement of India through aid to Myanmar, Bangladesh, Nepal, Pakistan, Sri Lanka, and others. China is the chief reason that India has not been admitted to the Nuclear Suppliers Group or made a permanent member of the United Nations Security Council. Further, China is headed down the road to autocratic instability. The major indicator of China’s opting for this path is Xi’s success in abolishing the constraint of term limits. With the change in China’s constitution that Xi engineered, he is now set to be, like Mao, the supreme leader for life. With this in prospect, the safety valves for popular dissent, inherent in a democracy will not be present. In the long run, there will not be the kind of political relief that prevents cataclysmic change. Autocracy also augers for increased belligerence in the autocrat’s conduct of international affairs. Without the ability to let off political steam, authoritarian regimes are more likely than democracies to promote unity by military adventures that engender a sense of loyalty to the regime. Belligerent actions can provide a rationale for increased autocracy to fulfill a supposed need for a command and control system to meet the threats of foreigners. Partnerships between and among democracies have the added advantage of increased ease of communication and understanding that is likely to make them stronger and more stable in the long run. Even with less than ideal leaders, democracies have a well of political commonality from which to draw. This understanding is engendered by common systems that enable an appreciation for the processes and difficulties of decision making when the approval of citizens is ultimately necessary. It is easier for decision-makers to communicate with their counterparts if they have the shared experiences of operating in democracies. The forces operating within and upon autocratic governments are opaque and difficult to understand. The United States and India should reaffirm democracy as a driving consideration in the conduct of their foreign relations and choice of strategic partners. This is not just for altruistic reasons. In the long run, democracy promotes stability, peace, prosperity, and understanding in partner relations. These goals should not be curtailed for shorter run tactical or financial advantages. Raymond E. Vickery Jr. is a senior associate of the Wadhwani Chair in U.S.-India Policy Studies at the Center for Strategic and International Studies in Washington, D.C.